Heat oven to 375°F. Line cookie sheet with foil. Pierce sweet potatoes with fork; place on cookie sheet. Bake 1 hour to 1 hour 15 minutes or until tender when pierced with fork. Let stand 15 minutes or until cool enough to handle. Meanwhile, in 10-inch nonstick skillet, melt 2 tablespoons of the butter over medium heat. Cook apples, cinnamon and sugar in butter 5 to 7 minutes, stirring frequently, until apples are tender. Spray 13x9-inch (3-quart) glass baking dish with cooking spray. 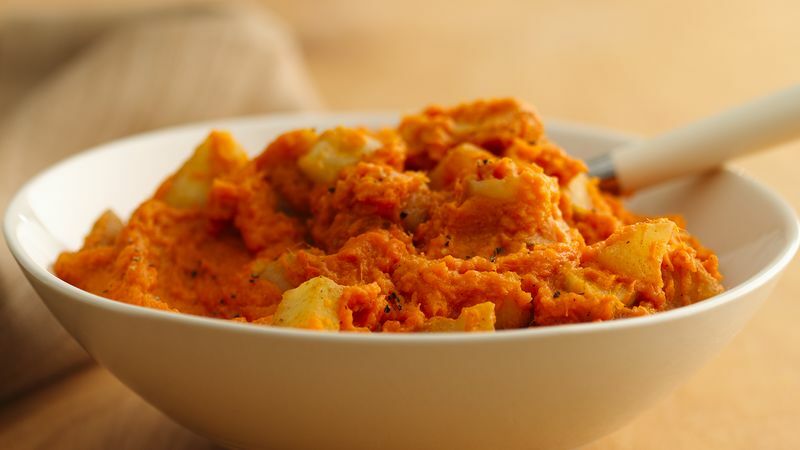 Slip off sweet potato skins; place potatoes in large bowl. Add salt, pepper and remaining 6 tablespoons butter; mash until no lumps remain. Add apple mixture; mix well. Spread in baking dish. Use your favorite kind of apples in this recipe; try 1 tart apple and 2 of a sweeter variety.